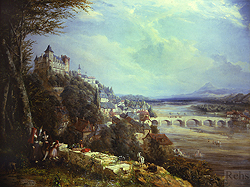 William Oliver, one of the more popular Victorian artists of his time, was known for his lively and realistic depictions of the many picturesque views throughout the Grand Tour (a tour of continental Europe taken by young men of British aristocracy to complete their education) and the West of England. Oliver was particularly fond of the Pyrenean area of France and Spain, and completed many small studies of the towns and villages in this area. Many of these small works were then purchased by the young travelers as souvenirs of their Grand Tour. While he favored painting plein air works, he did complete a number of large and important works during his career – most of which were either created for specific exhibitions or commissions. In 1840 he married Emma Eburne, who was an artist and student of his. Like her husband, she specialized in landscape painting and exhibited at numerous public exhibitions. William was a founding member of the New Watercolor Society and frequently exhibited at the major exhibition halls in London. He died in Halstead, Essex on November 2, 1853.